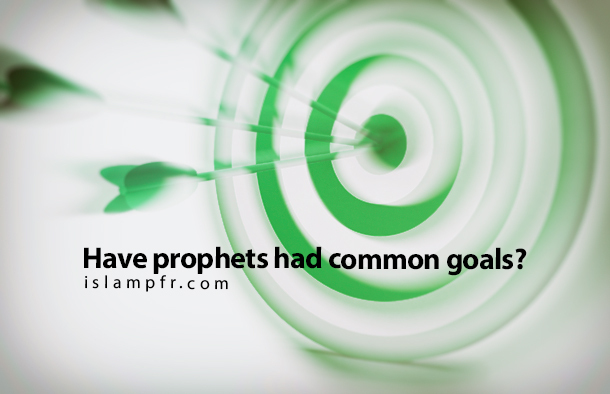 Home Articles	Have prophets had common goals? Prophets who have been appointed by God for the guidance of mankind have made efforts towards this mission with a synchronized plan and common goals. Studying the personality of the holy prophets, their way of personal and social life, the content of their message and their invitation makes mankind aware of the existence of some kind of synchronization and correlation. Multiple prophets have all been messengers and representatives from God and his wisdom has required that there be total synchronization among his messengers for the guidance of people. The first and the most basic teaching of the prophets’ movement is monotheism and the worship of God. Divine prophets have tried to rid people of paganism, idolatry and servitude of non-God; leading them towards worshipping and servitude of the unique God. Their other goals have all been a means to reach this final goal. The mentioned groups opposed prophets in different ways, labeling them as insane, wizards, power-hungry, etc. or tried to entice and threaten them; however, the prophets would withstand all the difficulties and would not desist from their invitation. About a thousand years of Noah (PBUH)’s struggle with his stubborn people, also years of Abraham (PBUH)’s theoretical and practical encounter with idolaters and Nimrod, furthermore Moses (PBUH)’s unremitting battle with Pharaoh and tolerating the narrow-mindedness of Israelites and finally twenty three years of the prophet Muhammad (PBUH)’s effort and Jihad with kaffirs, pagans and feudists are instances of the divine prophets’ struggle. Although annunciating and deterring include annunciating blessings and divine mercies in this world and also deterring from devastation and worldly torture, the holy prophets’ mission of deterring and annunciating is a reality beyond deterring and annunciating blessings and worldly torture; as worldly life is limited and will finally come to an end. If there shall be no Resurrection, it would be cruelty to righteous worshippers and this is incompatible with divine justice. Therefore, according to reason and the Holy verses and the narrations of the holy prophet (PBUH), occurrence of the Resurrection is definite; therefore, annunciating and deterring would also act as an ultimatum.